You can find beers everywhere in Paris, whether à la pression (on tap) or en bouteille (bottled beers), but you will often find the same international, mass-produced brands. 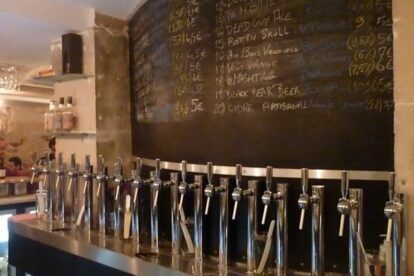 Thankfully, more and more places are specialised in bières artisanales – real ales or craft beers. There is such a really nice bar near the busy nightlife district of Oberkampf, but located one minute walk from the main street, in a quieter area, where you’re more prone to sipping your beers slowly than swallowing your cheap happy hour pint. Quite small, L-shaped around a counter, La Fine Mousse also offers a few tables at the extremities, and quite uncomfortable chairs. The list of beers regularly changes, but there are always 20 different beers on tap, covering a wide range of tastes, colours or rates of alcohol. In order to make up your mind, a short but accurate description of the characteristics of the beers is provided, and the staff is also well informed about what they sell. The prices can seem high (about € 4-5 € for a demi, ie 25 cl) but considering the quality of the beer, and the slow rhythm you’re suppose to drink them if you want to really enjoy them, it is quite reasonable! There’s also cider on tap and natural fruit juices, but I must admit I’ve never tasted them! It is also possible to eat planches of cold meat or cheese, and La Fine Mousse also opened its own restaurant (where you can match food and beer) right opposite the bar!